My latest favorite cookbook is Violet Bakery’s by Claire Ptak. I feel like most cookbooks are all the same these days. They use the same photo style with the filtered-look and the same minimalist design throughout. So before I pick up a copy of any cookbook these days, I skim through the pages and see if there’s even a recipe I would like to try at home either because it looks easy enough to test (in the case of baked goods) or if it’s interesting enough to bother. Otherwise, you can just Google everything, right? 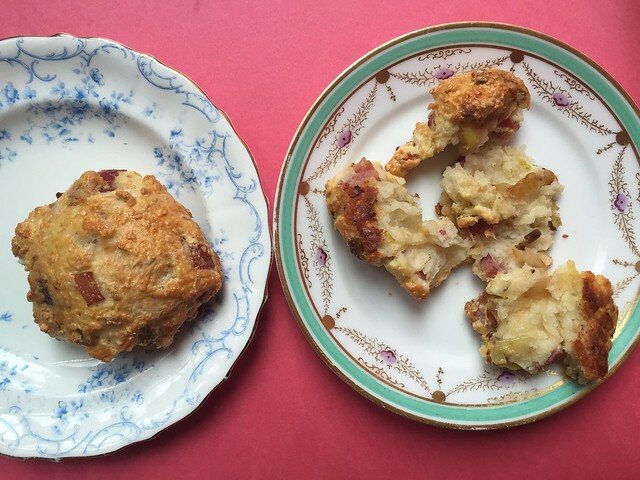 Claire Ptak’s recipe for these savory scones was one of those that made me salivate. I needed my friend Lisa’s help understanding some of the baking terms though. What the hell does it mean to cut the butter? She found my question amusing enough that she made a video with her iPhone of her holding two knives and making scissor-like motions with them upright–basically “cutting through” the butter. Now, I know that’s what bakers do and the term wouldn’t have elicited any reaction from baking pros, but to me, it just didn’t make sense. Why not just say mix the butter in with the flour and use the back of a fork to combine and make it crumbly? I changed that step below, so sue me! I also converted the measurements to plain ol’ American English so you don’t have to. Lastly, I only used cooked ham here from the meat counter at my supermarket, but feel free to use good quality prosciutto. 1. In a large skillet over medium-low heat, heat the smaller knob of butter and the oil until the butter starts to foam. Add the leeks and sauté for about 10-15 minutes until soft. Season with salt and pepper. When they are cooked, transfer to a bowl and chill in the fridge until ready to use. 2. In a medium bowl, combine and stir the parmesan, flour, and baking powder. Add and mix in the stick of butter with the back of a fork until crumbly. Add the yogurt, ham, and chilled leeks. Season with salt. Mix to combine and then form a cube and place on your lightly floured surface. 3. Pat the dough into a thick log and cut out scone triangles, about 12 of them. Line a baking sheet that can fit into your fridge with parchment paper. Place the scone on the sheet and chill to set, about 1 hour. 4. Preheat the oven to 350º. When ready to bake, line a different large baking tray with parchment paper, place the chilled scones on it and brush the scones with the egg wash. Bake for 25-30 minutes until golden. 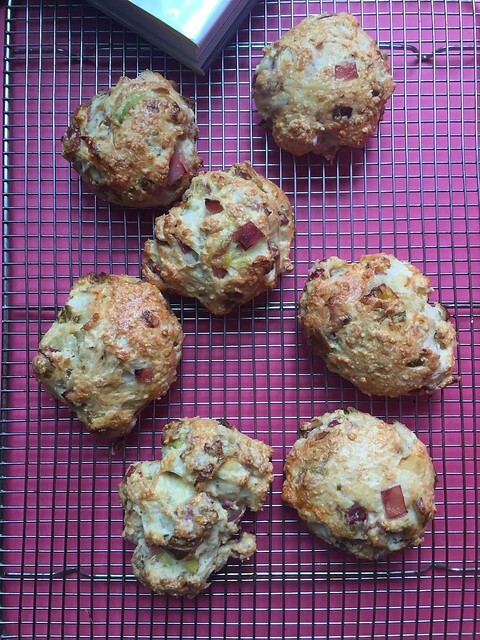 The Violet Bakery Cookbook is very pretty and practical at once.